Designed for smooth, high precision cutting of larger format tiles. Cutting head carriage with ball bearings for greater accuracy and easier use. The high precision cutting head has a replaceable tungsten carbide wheel. Large, graduated swivelling cutting guide and shock absorbing trays. Wheels and a carrying handle for easy transportation. 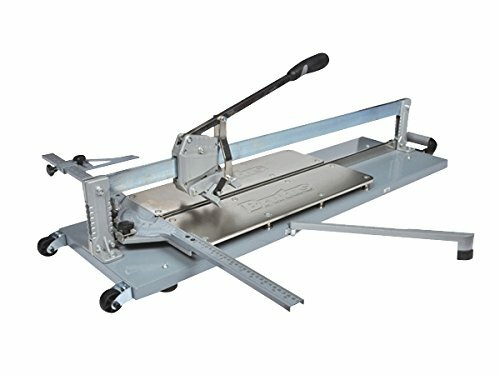 The Vitrex BRUTUS750 Clinker XL Tile Cutter is a professional heavy-duty tile cutter, designed for smooth, high precision cutting of larger format tiles. The tile cutter has a cutting head carriage with ball bearings for greater accuracy and easier use. The high precision cutting head has a replaceable tungsten carbide wheel. The BRUTUS750 has table extensions, which are ideal for supporting larger format tiles. In addition, it has a large, graduated swivelling cutting guide and shock absorbing trays. For easy transport, it has wheels and a carrying handle and for comfort it has a co-moulded handle. 2 year guarantee. Specification Maximum Straight Cut: 750mm. Max Diagonal Cut: 530mm. Max Thickness: 20mm.